How to know if my throat infection is viral or bacterial? 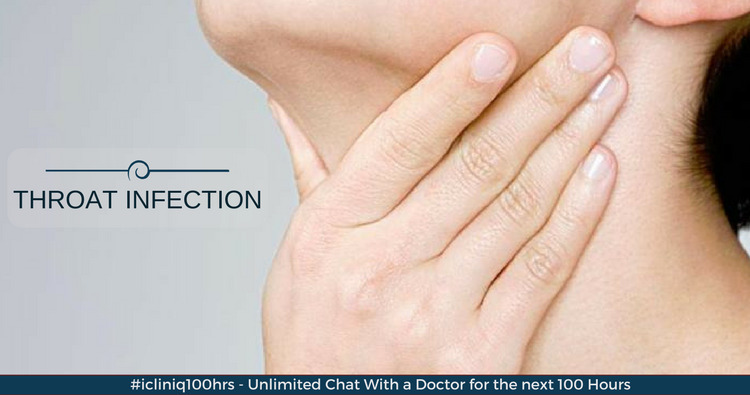 iCliniq › Ask a doctor online › Answers › Otolaryngology (E.N.T) › Throat Infection › How to know if my throat infection is viral or bacterial? Q. How to know if my throat infection is viral or bacterial? I have a bad throat infection and fever. At present, I have a fever of 101 F. I took Meftal forte 45 minutes back, but the fever has still not come down. Can I take Paracetamol? My doctor gave me Augmentin and Allegra-D.
• What causes swollen tonsils with fever, body aches and runny nose? If your doctor has examined you and started you on antibiotics, that is, Augmentin (Clavulanic acid and Amoxicillin), you, please complete that course. Along with it, I suggest taking Paracetamol 500, three times daily. Continue taking Allegra (Fexofenadine). Thank you for replying. Can these medicines affect my liver, as I have fatty liver? I am scared about that, so I avoid taking medicines. What food should I avoid? Was your doctor an ENT specialist? If so, continue the medicines as he has told you. That is the antibiotic Augmentin with Paracetamol. Paracetamol can be taken twice daily. Once antibiotic is started, the infection will subside, and you will not require Paracetamol. You may take Paracetamol 500 mg, twice daily. If you have already taken Meftal tablet (Paracetamol and Mefenamic acid), wait for two hours before taking Paracetamol. If your doctor is not an ENT doctor, then please upload a picture of your throat. You may click a photo of the throat with an open mouth, focussing on the posterior pharyngeal wall and tonsils without flash, standing in front of a mirror. That will give us an idea about the infection and condition of the throat. Additionally, some anti-inflammatory medicines can hasten recovery. In your next query, do attach the blood reports, which show fatty liver. It will help us in finalizing the course of treatment. Do warm saline gargles and avoid spicy, oily, and cold foods till you get completely better. Avoid smoking and drinking as well. Thank you for replying. My fever has gone down by a degree. Do I need to take antibiotics if it is a viral infection? How to know if it is a bacterial or viral infection? I have attached a picture of my throat. I looked into the pictures you have sent (attachment removed to protect patient identity). You have taken the trouble and sent those, I appreciate it. Though I cannot have a complete look of the oropharyngeal area despite you depressing the tongue, with what I can see, I feel it is not a bacterial infection. A bacterial infection is accompanied by thick yellow discharge, severe pain, severe inflammation, and redness of the pharyngeal area. Sometimes, the throat region shows plenty of granular congested spots. A viral infection, on the other hand, produces less viscous mucous and is self-limiting. Viral infections do not require antibiotics. However, some of them require antiviral medicines. In your case, I can see big tonsils. Tonsillar enlargement, throat pain, and fever point to acute tonsillitis. If such infections and pains bother you many times a year, we can safely remove the tonsils, and this will not cause any side effect. Tonsils have a protective role only in childhood. Tonsils can be a cause for an ear infection, snoring, mouth breathing, dry mouth, bad smell from mouth, and chest infections. Right now, in addition to the Augmentin antibiotic, I suggest you take Chymoral forte. This is an anti-inflammatory medicine, which reduces the edema and swelling in the region helping in faster healing. Consult your specialist doctor, discuss with him or her and start taking the medicine after their consent. Gargling with diluted Betadine mouthwash will be helpful after each meal to remove any offending agent or pus from the pharyngeal area. Meanwhile, you are advised to rest at home and avoid pollution and the sun. Throat swab for culture and sensitivity. Complete blood count inclusive of ESR (erythrocyte sedimentation rate), TLC (total leucocyte count), and DLC (differential leucocyte count). LFT (liver function test) & KFT (kidney function test). Do revert if you have any more questions. I will be happy to help you. So, should I keep taking Augmentin? Why are LFT and KFT needed? Augmentin is needed because I cannot confirm whether the infection is bacterial or viral. In our country, we anticipate bacterial infections because of the germs and pathogens prevalent. If the offending agent is bacterial, indeed this will help you. If it is viral, then this is not going to do any harm but will prevent the probability of an added bacterial infection. The liver function tests and kidney function tests will tell us if there is any issue concerning the liver, as you had mentioned fatty liver. The medicines we take are excreted out of the body through the liver or kidney. If there is any decrease in their functioning, we should detect it early and give appropriate medicines. The medicines we give should not worsen the liver or kidney damage. I got my tonsils removed last year. Now, I have redness on one side. Why?